On Demand is the combination of the best software solutions that Promero offers. On-demand omni-channel call center software is an integrated software suite that includes solutions from Oracle, Aspect, Five9, Bright Pattern, Salesforce, Zendesk, ServiceCloud, Verint, Pipkins, Monet and CallMienr. On Demand includes a fully integrated suite of products for call center operators. Customer relationship management software, call center software, lead management and sales analytics software are included in a single hosted platform. This winning combination provides the ability to make (predictive or preview) or take calls in a blended call center seat, compile customer information, route callers to the most skilled agents and more! Outsource call centers can provide lead generation services with ease. Hot transfer live calls along with data files to the sales agent in real time. 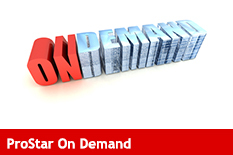 ProStar OnDemand is the perfect solution. Complete turnkey blended call center application that includes Inbound IVR/ACD, Outbound Predictive Dialer, Recordings, VOIP and more.